The SYSLINUX Project covers lightweight bootloaders for MS-DOS FAT filesystems (SYSLINUX), network booting (PXELINUX), bootable “El Torito” CD-ROMs (ISOLINUX), and Linux ext2/ext3 filesystems (EXTLINUX). The project also includes MEMDISK, a tool to boot legacy operating systems (such as DOS) from nontraditional media; it is usually used in conjunction with PXELINUX and ISOLINUX. SYSLINUX 3.62 was released on March 1, 2008. This was a new feature release. See the change log for details. SYSLINUX 3.61 was released on February 3, 2008. This was a bug fix release. See the change log for details. SYSLINUX 3.60 was released on January 10, 2008. This was a new feature release. See the change log for details. SYSLINUX 3.55 was released on January 10, 2008. This was a minor bugfix/enhancement release. See the change log for details. SYSLINUX 3.54 was released on December 12, 2007. This was a minor bugfix release. See the change log for details. SYSLINUX 3.53 was released on November 11, 2007. This was a minor bugfix release. See the change log for details. SYSLINUX 3.52 was released on September 25, 2007. This was a minor bugfix release. See the change log for details. SYSLINUX 3.51 was released on June 11, 2007. This was a minor bugfix release. See the change log for details. SYSLINUX 3.50 was released on June 9, 2007. This is a major new feature release. See the change log for details. SYSLINUX 3.36 was released on February 10, 2007. See the change log for details. SYSLINUX 3.35 was released on January 30, 2007. See the change log for details. SYSLINUX 3.31 was released on September 25, 2006. This is a minor update to the new graphical menu system introduced in 3.30. SYSLINUX 3.30 was released on September 18, 2006. This release offers a brand new graphical version of the Simple Menu System. See the screenshots page to see what it looks like, or the menu page for more information. See the change log for details. How a livecd come to life? Most new Servers or Workstations aren’t equipped with a floppy drive anymore, but from time to time I need to boot from a floppy drive. And I don’t want to burn a CD each time I need to boot from a floppy drive.. so the solution is tftpd32 and PXELINUX. With those 2 tools I’m able to boot disk images from the LAN. You need tftpd32 from Ph. Jounin (http://tftpd32.jounin.net/) and PXELINUX, which is a part of the SYSLINUX package (http://syslinux.zytor.com). 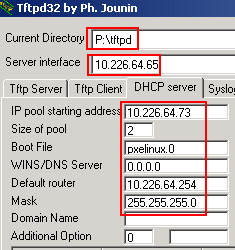 Tftpd32 act’s as DHCP and TFTP server (of course you can use another DHCP Server) while PXELINUX provide booting Linux from the network. You can download the ready-for-use package here. bootimages – the uncompressed (*.IMA) disk images. Change the Current Directory and the IP settings, so that they fit your needs. 5. ifconfig是最常用的网络配置工具。 ping通过发送ICMP消息观察一台网上机器是否可被连通。 RedHat的sndconfig用于配置声卡。 minicom用于配置modem. 10. /etc/lilo.conf 中有Lilo的配置信息。 编辑完此文件后必须运行/sbin/lilo安装LILO bootloader. 26. The lpc utility is the main one used to manage the print service,while lpq is the primary tool for looking at and interacting with the print queue. 28. The /etc/printcap file is a database defining what each known printer is capable of. It is read once by lpd at starup. 29. The lpd.perms file hods the permissions for the lpd service and can affect the operation as such utilities as lpc and lpq. 30. The lpd.conf file is used to configure the actual lpd service. There are 180 options that can be configured. 31. The lprm command is used to remove print jobs, and lprm -a will attempt to remove all spooled jobs. 44. inetd 是超级daemon, 调用其他服务. 它使用/etc/inetd.conf配置文件决定应管理哪些服务. 45. hosts.allow 和 hosts.deny 用于访问控制. NFS 使用/etc/exports提供的配置决定export那些文件系统. SMB用于与WINDOWS主机通讯. NMB用于识别WINDOWS主机提供的资源. 46. sendmail.cf 是 sendmail的主要配置文件. /etc/aliases 提供mail地址别名. /var/spool/mqueue 中存有mail的消息队列. mailq用于检查mail的消息队列. newaliases 用于建立新的别名文件. 50. shadow password用于提高 /etc/passwd的安全性. 应使用quotas对用户的磁盘空间进行限制. 应有对密码的安全性检查, 保证密码至少有6-8个字符, 并定期更换密码.